Argyll, archaically Argyle, is a region of western Scotland corresponding with most of the part of ancient Dál Riata that was located on the island of Great Britain, and in a historical context can be used to mean the entire western seaboard between the Mull of Kintyre and Cape Wrath. The early thirteenth century author of De Situ Albanie explains that "the name Arregathel means margin of the Scots or Irish, because all Scots and Irish are generally called Gattheli, from their ancient warleader known as Gaithelglas." However, it is often understood to derive from Earra-Ghàidheal, "Coast of Gaels". Argyll was a medieval Bishopric too, with its cathedral at Lismore, as well as an early modern Earldom and Duchy, the Duchy of Argyll. 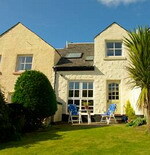 Airy Cottage is a spacious family home which is ideal for a family holiday. It has been recently and sympathetically refurbished to offer accomodation for families of up to 8 people. Airy Cottage has full central heating, 2 bathrooms, 4 bedrooms (2 Doubles and 2 Twin), a seperate TV room (idela for older children) a spacious lounge, a large dining room with an open fire (ideal for sitting in post dinner with friends/family with a glass of wine on those cooler winter evenings). Airy also benefits from a large garden and an enclosed deck area to the front of the property. Tighnabruaich has the following amenities: 2 local general stores, 2 local post offices, 3 local hotels, 2 local bistros/eateries, a sailing school, a golf course (9 holes), a childrens play park, a shinty pitch, tennis courts, a beach within 10 minutes and a collection of antique/bric a brac shops. Sleeps 8. MULLACH DUBH (pronounced Doo!) is our superb modern spacious cottage, located in the prestigious beautiful tiny Marina village of Craobh Haven (pronounced Croov! ), 20 miles south of Oban. The setting is arguably in Argyll’s most spectacular scenery, with stunning views of sea lochs, inner Hebridean islands, amazing sunsets, wildlife and views, offering the very best location for a perfect holiday. We have Scottish Tourist Board Four Star Quality Standards. Our beautiful new family home has been lovingly and proudly totally redecorated, refurnished and re-carpeted to meet the highest sophisticated modern standards., It has 2 bedrooms, 2 bathrooms and sleeps 6 people. It has full heating in all rooms. The open plan living area is spacious, clean, warm and bright throughout – with sun pouring in from the large windows to the front and back, giving views to our namesake, Mullach Dubh, the bracken and heather “tweed” tapestry hillside behind. Sleeps 6. 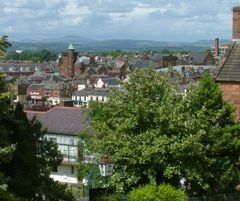 Dumfries is a market town and former royal burgh within the Dumfries and Galloway council area of Scotland and is situated close to the Solway Firth, near the mouth of the River Nith. Dumfries was the county town of the former county of Dumfriesshire. The name Dumfries is suggested by some to originate from the Scottish Gaelic name Dún Phris which means "Fort of the Thicket". People from Dumfries are known colloquially as Doonhamers. Galloway is an area in southwestern Scotland. It usually refers to the former counties of Wigtown (or historically West Galloway) and Kirkcudbright (or historically East Galloway). 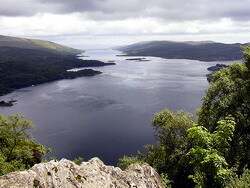 It is part of the Dumfries and Galloway council area of Scotland. Galloway is contained by sea to the west and south, the Galloway Hills to the north, and the River Nith to the east; the border between Kirkcudbright and Wigtownshire is marked by the River Cree. The definition has, however, fluctuated greatly in size over history. The name is also given to a hardy breed of black, hornless beef cattle native to the region (and also to the more distinctive 'Belted Galloway' or 'Beltie'). Galloway has always been slightly isolated due to having 150 miles (240 km) of rugged coastline and a vast range of largely uninhabited hills to the North. Heron Lodge.......set in a lovely peaceful,rural location on the edge of Mabie Forest.......a tranquil and peaceful location surrounded by beautiful countryside with views of hills and Mabie Forest. This luxury lodge is privately owned and can accommodate 4 guests in comfort with all modern amenities. Set in the former grounds of Cairnyard House on an uncommercialised site. 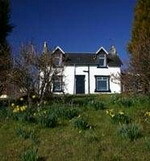 Located 5 miles from Dumfries town on the A711 (Dumfries and Dalbeattie Road) and 1 mile before Beeswing village. Take a relaxing weeks break either to take in the surrounding countryside and area or venture out and about to explore historical places of interest....take time out to persue your hobbies or interests like fishing..bird watching, golf, walking, trekking, cycling and horse riding. Sleeps 4. Mountain Lodge, Wanlockhead, Scotland's highest village on the southern upland way, with stunning scenery and walks right on your doorstep. very comfortable country cottage, renovated to a very high standard in 2007. cottage is warm and comfortable even in the most extreme weather , which can get extreme in the depths of winter. if quiet location in lovely surrounding countryside is what you are after then this property right on the southern upland way, is a must. detached cottage with very nice views. virtually no light pollution due to its remote location so the stars at night are trully spectacular. You might even get a white Christmas. Sledges available. Sleeps 6.